Water is not only used in the domestic context, but also in agriculture and industry in the production of commercial goods, from food to paper. The water footprint is an indicator of freshwater use that looks at both direct and indirect use of water by a consumer or producer. The water footprint of an individual, community or business is defined as the total volume of freshwater that is used to produce the goods and services consumed by the individual or community or produced by the business. This book shows how the water footprint concept can be used to quantify and map the water use behind consumption and how it can guide reduction of water use to a sustainable level. With a number of case studies, it illustrates water use along supply chains and that water consumption at one place is often linked to water use at another. For example, it is calculated that it takes 15,000 litres of water to produce 1 kg of beef, or 8,000 litres of water to produce a pair of jeans. The book shows that imports of water-intensive products can highly benefit water-scarce countries, but also that this creates a dependency on foreign water resources. The book demonstrates how water-scarce regions sometimes, nevertheless, use lots of water for making export products. 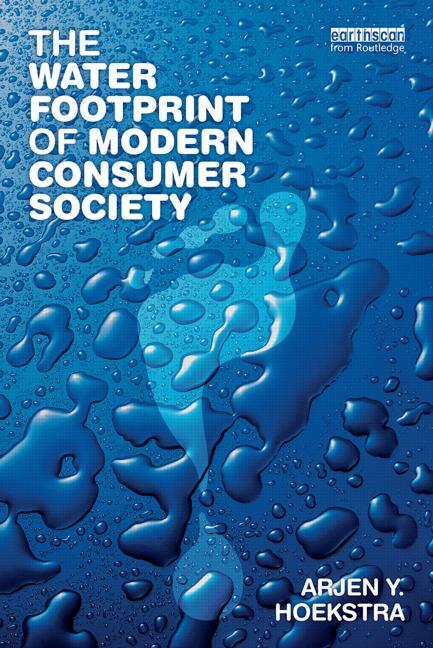 It raises the issue of sustainable consumption: how can consumers, businesses and governments get involved in reducing the water footprints of final consumer goods? 14. Who will be the Heroes of Change? Arjen Y. Hoekstra is Professor in Water Management at the University of Twente in the Netherlands, creator of the water footprint concept and co-founder of the Water Footprint Network. He specializes in integrated water resources planning and management, river basin management and policy analysis.